Will Google’s speakable schema mark-up make voice optimisation the future of SEO? Since virtual assistants like Microsoft’s Cortana and Amazon’s Alexa hit the market, there’s been some quiet chatter in the SEO industry of what this new technology might mean for the future. Until recently, however, there’s been a tacit agreement that, while voice searching may revolutionise SEO in a few years, it’s not yet widespread enough to make a significant impact. But the recent change to Google algorithms has paved the way for spoken voice searches to become increasingly prominent in search results. The question now is how, and how quickly, SEO will adapt to keep up. What is speakable schema mark-up? Speakable, Google’s schema mark-up is a tool that allows people to ‘mark up’ sections of their content that would be suitable answers for voice searches. If Google then determines your content to be of relevance to the search, software like Google Assistant, Microsoft Cortana and Alexa will read back the relevant section. Right now, it’s in its beta phase. That means it only works in the US, on Google Home devices and android phones with Google Assistant – and only for news articles. 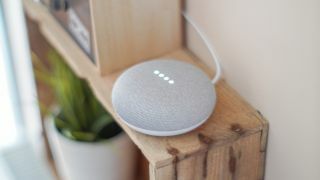 So, unless you’ve written a news article and want someone to access it via Google Home in the US, you’ll have to wait a little longer for the changes to affect you. It’s almost inevitable that the changes will spread before long, however, so the days when SEO experts could avoid all thought of voice searches are definitely over. In practice, the process of optimising blogs for spoken searches is actually going to be quite similar to getting a featured snippet. The purpose of the exercise is virtually the same: to get Google to pick out a section of your blog and present it through their own platform as the most reliable and digestible answer to a user’s search query. Google uses the same criteria to judge ‘Speakable-enabled’ content as they do Google news. The full list is available here, but most of it involves common sense rules on acceptable language, explicit content, grammar and sourcing. Once you’ve decided that your content will be accepted by the algorithm, you need to set it up. Unlike normal Google searches, it doesn’t happen automatically, so you’ll need to add some code into your content’s html file to ‘enable’ it, and let Google know what parts to pull out. Here’s an example template that Google produced. Most of the content should be a simple ‘copy and paste’ job, but a few things may need changing along the way to ensure your content is properly optimised. Ensure, for example, that you input the correct URL, change the ‘name’ category to match the name of your content and ‘type’ to match the style (‘article’ or ‘webpage’). This will help Google determine what, and how relevant, your content is. After that, it’s a simple case of finding the best ‘pull-out’ section and inserting it as text into the code itself. The idea of optimising search content for voice searches initially sounds daunting. But the technology is just about sophisticated enough to pick out relevant sections of a webpage and read them back to you. From a technological standpoint, voice and written searches are almost identical. The difference comes in the words and phrases individual speakers use to construct their searches. For now, voice searches will differ from written searches, but not drastically. Voice searches are significantly more likely to relate to localised content. They are also likely to be questions with short, simple answers. In short questions like ‘Search for hairdressers near me’ and ‘How do I boil an egg?’ are going to form far higher a proportion of voice searches than their written counterparts. It’s almost inevitable that the Speakable schema mark-up tool will expand further. When it does, it’ll be particularly well suited for applicable, ‘how-to’ style content, which can be answered simply in a few phrases. If you’re a content creator that specialises in this type of content, there’s definite value in working out what makes Speakable tick before it reaches you. There’s no real way of predicting when voice searches will truly catch on, or how much the technology will develop once they do. But the chances are that voice searches will develop to fulfill far more complex search queries than they can today. Speakable is a small change that won’t drastically affect your SEO practices (at least not yet!). But as online navigation and interaction with content moves increasingly off-screen, it’s certainly the first stage in a much longer, and more profound change. In a few years, SEO could be unrecognisable. Those that see the opportunity here and adapt as the changes come will maintain those all-important search rankings as the years progress. Matthew Rooke is Content Writer for Fifty Five and Five, a digital marketing agency in London that help technology companies to communicate more effectively, reach new audiences and drive leads.